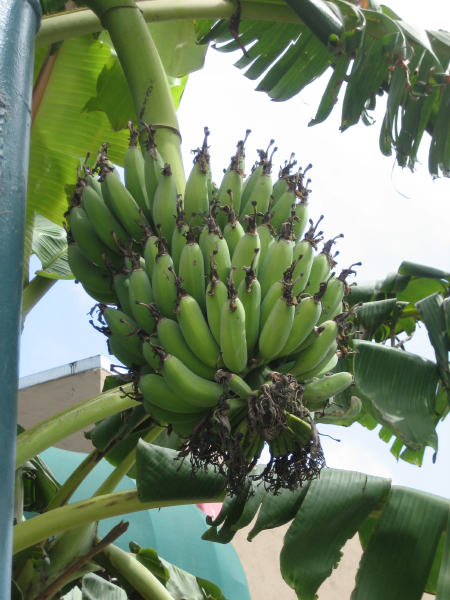 One of my most popular posts has been one from last year about banana trees, and searches related to bananas, fruit trees, and the like are regularly at the top of the search terms used to find this blog. Regular readers and Berkeley gardeners may remember, however, the past winter’s rare cold spell and its damage to plants. As a result, I was not expecting to satisfy eager banana Googlers with more photos of local bananas. Imagine my surprise yesterday when I was walking in South Berkeley near Alta Bates Hospital and spotted a bunch of bananas growing on a tree in front of a house on Dana street! As you can see from the photo, the bananas are quite green and probably don’t stand much of a chance of ripening completely now that we are into October. Nonetheless, it was fun to see the bananas and thing about the cycle of plant life. And speaking of plants, I have spotted a few instances of guerrilla gardening while out walking during the summer and fall. “Guerrilla gardening” involves acts of planting seeds and plants secretly or without asking for permission. This might be in the form of throwing wildflower seed balls (seeds mixed with compost and clay) in to a vacant lot or sneaking some vegetables into a landscaped bed of annual flowers. 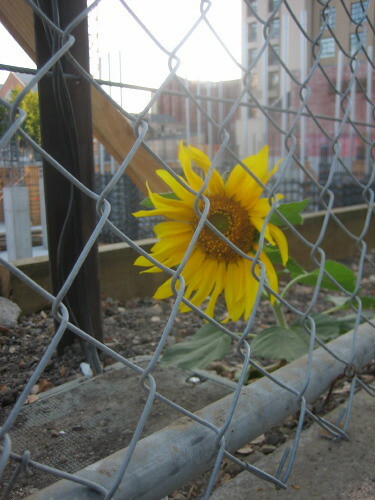 Near the Here/There art that I wrote about a few weeks ago, was a huge sunflower in an otherwise unplanted area near the intersection. The photo above was taken at the building site for the David Brower Building/Oxford Plaza in downtown Berkeley. The development, which is under construction now after several years of negotiations, is expected to open in 2009. I have also seen little gardens planted in various abandoned spaces in other parts of town, but I’ll leave those unnamed. If you are interested in reading more about guerrilla gardening, a book was published on the subject earlier this year, Guerrilla Gardening: A Manualfesto. I haven’t read that one yet, but I can recommend two other books with information on the subject: Avant Gardening (published by Autonomedia) and Urban Wilds, edited by local author Cleo Woelfe-Erskine. A number of readers are interested in gardens, so I thought I’d let you know that I will be leading a “fall harvest” walk for the Berkeley Path Wanderers on Saturday, October 20. The walk (which is free and open to the public) starts at 10 a.m. at the North Berkeley BART station, and will visit school and community gardens in the Northbrae and Westbrae neighborhoods to see what is ready for harvest and what is being planted for the fall and winter seasons. The walk may last 3 hours, but it is completely flat and there will be places for people to break off and return to the start. For those interested in fruit trees, we will be on the lookout along the way for trees that have fall fruit, such as citrus and persimmons. I’m also excited to announce that the Path Wanderers asked me to be on their board for the next term starting in 2008. As you know, I have been using the Path Wanderers map to track my progress of walking all of the streets and paths in Berkeley. A new edition of the map was just released, which you can get at local bookstores or order by mail. Unlike many maps, this one has been extremely durable; despite many, many foldings and unfoldings throughout the course of my walk, its has not ripped. I also have enjoyed using the map because it is clear and easy to read, especially the markings for the stairways and paths. In addition to the map, the Path Wanderers repairs and maintains paths and stairways and offers monthly walks on Wednesdays and Saturdays in Berkeley and in other East Bay locations. Membership is $5 per year, and the group accepts monetary donations and tools. The Path Wanders annual meeting is next Thursday evening at the Hillside Club, and is also free and open to the public. The featured event at the meeting will discuss two trails that will eventually circle the Bay Area — the Bay Trail and the Bay Area Ridge Trail. The Bay Trail, which I mentioned in a post awhile back, runs close to the Bay’s shoreline and (when completed) will form a 400-mile network of paths and trails for walking, biking, and other recreational activities. The Bay Trail is extremely varied, as it passes through both natural areas and industrial and urban settings. The Bay Area Ridge Trail, by contrast, circles the Bay along the ridgeline and will be 500 miles long when completed. It passes through many parks and open space areas, and is used by hikers, equestrians, and mountain bikers. The Berkeley section is complete, and runs through Tilden Park. The completion of both of these trails will be a challege because of the multiple agencies and owners that have to be negotiated with to open up the trails. I would like to think that in my lifetime I will get a chance to walk one of these trails in its entirety, but it will likely be some time before that happens. In the meantime, though, there is plenty to explore on the large sections of the trails that are open! Fruit Tree Follow-up: Bananas in Berkeley? Yes! 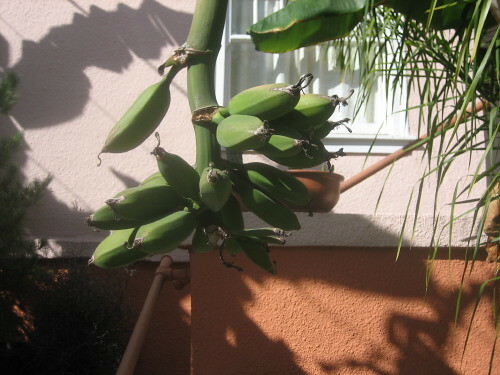 I received quite a few messages in response to my fruit trees post last month, including a couple of tips about fruiting banana trees in the area. The first one is near San Pablo, several blocks south of the north Berkeley border. It difficult to tell from the photo, but this is a very big banana tree. It seems hard to believe that got to be that size in outdoors in Berkeley, which is far from a tropical environment. Just over the Berkeley border on San Pablo is another tree in front of Ruen Pair, a Thai restaurant. I am familiar with the seasons for most fruit, but have no idea when bananas would be growing, so I was pleasantly surprised to find actual bananas growing on the tree! My next task will be to find out if any nurseries carry these trees. Interestingly, I recently wandered through Berkeley Horticultural Nursery (a favorite nursery of many Berkeley gardeners) on a recent walk and noticed that they had a few tropical fruit trees such as mangoes and guavas. I asked an employee whether they would really fruit here, and he said it was unclear whether they would; you really have to have to find the right spot and protect it from frost (not usually much frost here) and maybe in several years, if you are lucky, you will get a fruit or two. I may be willing to take that chance if I find a banana tree. Also related to the fruit trees post, I found that Michael Pollan‘s recent book “The Omnivore’s Dilemma” includes a brief description of looking for fruit from neighborhood fruit trees in Berkeley. Actually, there are a few mentions of Berkeley in the book (Pollan is currently teaching at the U.C. Berkeley Graduate School of Journalism), most notably his commentary on a visit to the Berkeley Whole Foods Market, which generated a response from the Whole Foods CEO. In one of the meals he prepares as part of this book, he includes bing cherries from a tree in Berkeley and chamomile gathered in Claremont Canyon.